Ayesha is a conservation biologist with a passion for the ecology of birds and mammals, who began her career in Australia working with the National Parks and Wildlife Service in Royal National Park, New South Wales, to measure the response of small mammals including the threatened eastern pygmy possum to the devastating bushfires of 2001. She spent several years working as a zookeeper then as a landscape restoration project manager for the non-government organisation Greening Australia. Ayesha returned to academia in 2009 to complete a PhD with Professor Hugh Possingham and Dr Kerrie Wilson at the University of Queensland's School of Biological Sciences, focusing on cost-effective and efficient resource allocation and decision-making processes for monitoring and managing threats to biodiversity. She then took up a one-year research fellow position with the Centre for Biodiversity and Conservation Science, exploring ways to account for uncertainty and risk in conservation planning and monitoring decisions. In 2013 Ayesha joined Dr Jonathan Rhodes at the School of Geography, Planning and Environmental Management as a National Environmental Research Program (NERP) research fellow, to deliver a project in collaboration with the Australian Department of the Environment, the South Australian Government, and Dr Ascelin Gordon at RMIT University, investigating cumulative impacts of threatening processes on species in the arid zone of South Australia. In 2014 Ayesha started as a research fellow with Prof David Lindenmayer in the Fenner School at ANU. She continued her research into optimal monitoring of networks of species as well as working on long-term monitoring data from endangered Grassy Box woodlands to understand variability in species' responses to threat management actions. Ayesha commenced an ARC DECRA Fellowship at the University of Sydney in September 2017. 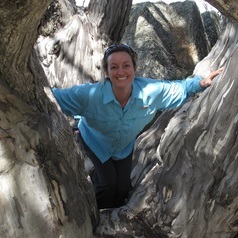 Her research is focused on informing ecosystem assessments of vulnerability and priorities for recovery, through an understanding of species co-occurrence and the effects of threats and their management on associations. Ayesha's long-time interest in learning about birds and how best to mitigate their threatening processes has led to her involvement with ongoing citizen science programs such as Eremaea eBird, an online bird survey database, and with BirdLife Australia's State of Australia's Birds report.